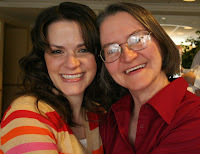 I love my mom and I think she's a beautiful lady (although she'll probably kill me for putting these up). We were glad that she and my dad were here for Caleb's blessing. We don't have many pictures of just us two so we took advantage of the lady with the camera. I saw your mom right before she went to see you and both your parents shortly after they came back. They were so happy to see that little guy. I actually just saw Joe today at church, he looks good. It's been forever since I've seen him. Well I'm glad to see you blogging again and hope to meet little Caleb when you come down to visit.